Often when I look at roses I feel an affinity with them. It could be one of those weird Enid Blyton-esque mind melds I sometimes get where I feel I may at some stage in the distant past have been a fairy living among the roses or it might just be the realisation that a rose is in many ways just like life. I know you, my friend, I often say when I see a rose. I know the crap you are going through. You may not know this but roses go through a lot of crap. There they are, dressed up to the nines, striking in their finery, basking in the admiring glances of those who pass by their gardens and suddenly a dog comes along and starts to dig them up or pees on them. Or a child comes along and picks them, pulling the petals off one by one. Or some lunatic do-gooder sprays home made bug mix on them that turns their vermilion petals brown. And then there is the wind and the rain. Not to mention the vagaries of sunlight. And birds and bees and children with errant footballs. And gardeners who really know nothing about gardening. If roses had a shoulder they would always be looking over it. If they had therapists they would always be in the waiting room, a list of the trials of life in the garden nestled amongst their petals, ready to vent. When I see a rosebud trembling, ready to open, I think how safe it is to be enclosed like that. How nice it is. And how daunting it is when that fragile little bud opens for the first time and embraces the light. One petal unfurls and then another. We dream of things. We hope for things. We strive for things. Pop pop pop. Our petals unfold and face the day. We are nervous and unsure but there we are, ready for whatever might come along. And the petals of the rose keep unfurling. And our schemes and plans and determination to take the world by storm keep thrusting themselves forward. And the unfurling and the unfolding continues until we are fully formed. Standing there in all our glory for the world to see. And there is a pause, a breath blown sideways where nothing conspires against us. And the roses and the people each think – This is it. This is the moment. But as we all know those moments – of revelation, of epiphany, of feeling we’ve made it, of shaking hands with our true selves – are fleeting, as hard to hold on to as a rose in full bloom. Along comes a wind, more blustery than expected. Maybe a bit of a rain, maybe an overexuberant dog, pouncing. The elements collude and all of a sudden the petals of the rose are gone, colouring the ground, fairy cloaks abandoned in a rush. And the rose is naked, shorn, unadorned. At odds with the garden, at odds with itself. And the rose thinks : Gee, I go through a lot of crap for that brief moment of beauty. But it goes on, waiting for more buds to form before it starts again because those beautiful moments like crystals in sunlight, like golden-edged smiles are worth it. So when I see a rose I tip my imaginary hat because I know what roses go through. And I think if we see both the rose and its thorns we see life. As it is. Steadfast, constant, keeping our faces turned towards the sun. Oh so true. What a wonderful tribute to the most beautiful of flowers. I am celebrating it’s special virtues over at MPP right now, great minds …. PS: You are a rose! I know the feeling … there’s no sadder sight than a load of rose petals on the lawn after a strong wind. You have to get out there & cut the seed pods off, so you’ll get more shoots … and more roses. Fortunately, mine are so well established that dogs and cats aren’t much of a problem. Someone once said … treat your roses like your troops; give them plenty of sunshine and plenty to drink. Feed them horse-manure occasionally, and they’re happy! You’ve given me a lot to think about, Selma. This made me nod and smile and tear up all at the same time. Beautiful writing, Selma. Just amazing. I know what a rose goes through too – and it makes it so much more beautiful than that first look at its luscious surface. Beautiful post my friend. The rose such a beautiful flower, and most smell divine also, but they do go through a lot, and need a bit of tender loving care. A beautifully written post. As Karen says, they are extremely resilient. I’ve never watered my roses. Through all the 40 degree days and bushfire seasons they’ve just kept going without even flinching. They love a good prune. The more I cut the better they grow. The saying should be “Tough as a rosebush.” Old boots, nails, pah! So are you. I do love roses!! Aww, thank you. I appreciate your visits so much! It is sad to see those petals on the lawn. 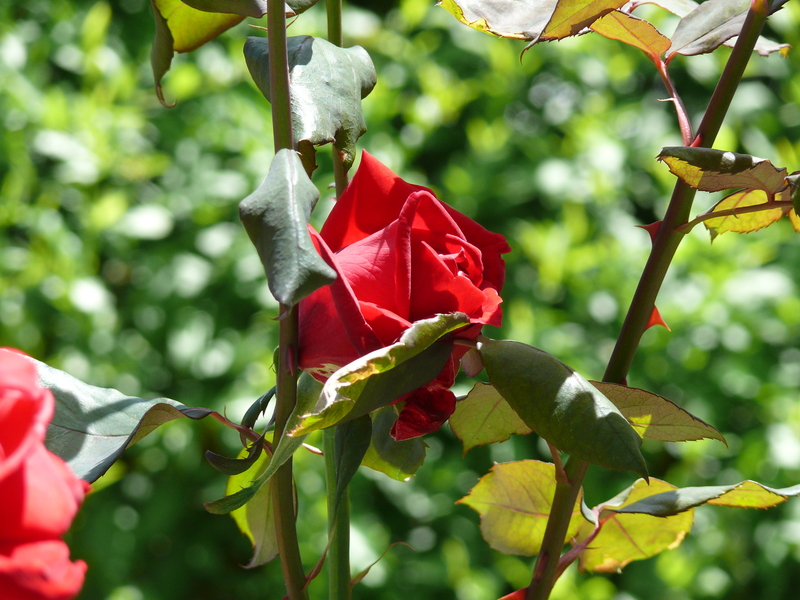 What you say about looking after roses is so true – they are easily pleased! I completely agree with you, particularly regarding the resilience part. That’s how I want to be remembered too. I had a rose bush in my front garden that was all shrivelled and I cut it right back. Now it is blooming with the most beautiful red roses. The photo above is one of them. It is like a fairytale. You are so lovely to say that. That means so much to me. And the struggle is definitely made bearable due to the happy moments. The smell is just spectacular. No wonder poets write so much about roses! You are so right. I’m going to use that from now on – ‘Tough as a rose.’ I really like that! this past summer i didnt have time to take care of the roses like i have done in the past, with frequent weeding, special rosefood, organic beetle repellent, antimold medicine, systemic preventions of their challenges such as slugs and mites, but they surprised me and grew anyway. now this climate is not a great one for anything but wild roses but of course i’d planted fragrant hybrids in select colors, including blue and salmon, every year for the last six years i have added one or two new bushes to the burgeoning rose garden. i didnt do any of that this year, didnt even trim the deadheads. but they grew anyway. and though they struggled with coldspots and a little uneven blooming, they still filled the place with color and scented the air. roses are so amazing. beautiful post selma! What an excellent post Selma. I haven’t been feeling very much like a rose these days, Ive been feeling more like I’m going through a lot of crap! The fragile, tender, colorful rose with the tough thorns to protect it from those curious little hands. Delicate and sturdy, tender and strong, beautiful with imperfections. All unique. Great analogy Selma! The other day, as I parked my car to go to the Market in town, I noticed a rose bush tucked in beside a white fence. It was blooming! This isn’t the time of year here when roses bloom, but there was no denying the dark pink petals adorning the thorny stems! Hardy determination was what I was thinking….. surviving despite the elements. The same could be said for us humans. This is so good Selma – one of your best blog posts – so true and the trick is to recognise those moments of perfection when they come along and really appreciate them. So now they are in a cute lttle vase in my living room making everything seem softer somehow. wonderful post, selma – just like you to see the down side, and then the bright side of the down side. you are rare. Life is a Rosh! A Rosh by any other name will still smell as sweet!! True, all those things you said about Rosh is very true. The optimist sees the Rosh and not its thorns; the pessimist stares at the thorns, oblivious to the Rosh. But no dog has peed on me. Just a baby cousin! LOL! I really like this post. Well written and a perfect correlation between a roses tenacity and a human beings ability to pick themselves up, dust themselves off and continue moving forward despite hardships we face. Your reflections on life are so remarkable, Selma. Truly! Yes , both roses and life are beautiful and thorny. and the snake at the word. and that is why you like us. Indeed, you are missed. Hope everything’s okay, love. Your lovely writing personifies one of my favourite flowers to perfection. Tender, heartfelt, insightful. This piece is lingering in me now. BTW, I love roses so much that I chose that name for someone I love. Okay, Im officially *worried*. You haven’t posted in far too long. Even me- Selma is everything okay? Ok, I think it’s time to call out a search party! Come back we miss you!! 5:06 AM Nov 11th via web in reply to absolutkatydid. She also posted a tweet 4 hrs ago. She’s (the cat’s mother!) is also propably busy with nanowrimo and life. David thanks for posting this. Being a creative writer I’d already jumped to all sorts of conclusions. Relief!